As I was preparing for this episode, I went back into Phase 1 of the 3four3 membership to watch a video of Gary Kleiban explaining the losing your man activity. He starts off by talking about the importance of players knowing how and when to create space for themselves and how the amount of space players have on the field becomes smaller and smaller as the level of play gets higher and higher. But then, he said something that resonated with me. Something that I have come to believe in wholeheartedly. 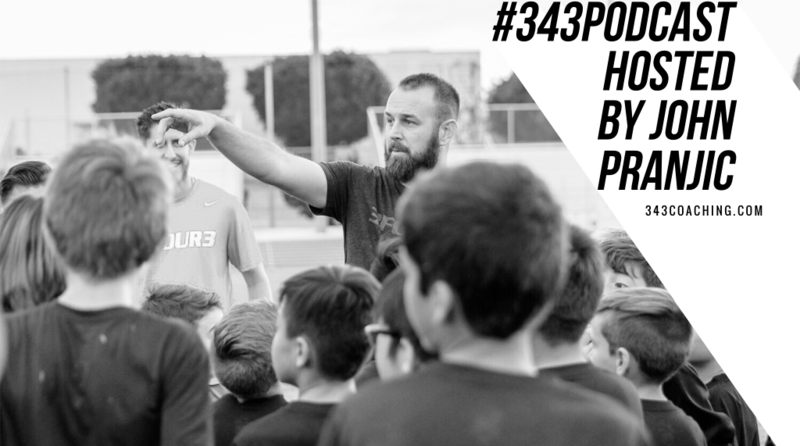 One important thing that I have learned during my time as a 3four3 member is that these crucial training activities, what we call our core exercises, have to be trained over and over again week after week for years and years in order for players to achieve any semblance of mastery during real games. Of course, you’re likely to see benefits if players train this leading up to a match, but in order to see it happening consistently in games, players have to train it consistently at practice. So, what is losing your man? And why is it so important that we think it should be trained so frequently? Losing your man is essentially creating a pocket of space between you and your opponent so you can receive the ball under little to no pressure. How do you do that? By faking a movement to drag your opponent in one direction and then quickly moving in a different direction to receive the ball. It seems so simple when you hear it. Even paid analysts see professional players executing this type of movement and think it’s simple or just a moment of spontaneous individual brilliance. But, that’s rarely the case. Players need to be taught how to lose their man and create space so that they can receive the ball under little to no pressure. We recommend using this movement when teaching your team how to transition from build up to attack. Because if your team has done the work in the back, got the ball under control and are keeping possession, why would you want your center backs or outside backs to play forward while defenders are draped all over your attackers backs? The attacking players need to create the pocket of space so they can receive the ball with less pressure. What does that do? Well, it increases the likelihood of retaining possession and if you’re looking to play possession-based soccer, then increasing the chances of keeping the ball during this transition from the back to the front is something you work on perfecting. But remember, you can’t just talk about this. You can’t just do it once, or once a week, or once a month. This thing we call losing your man is actually more important than you think. Eventually, this movement becomes incorporated in more than just connecting the backline to the frontline. The act of losing your man can become layered into more and more aspects of how you want your team to play on the field. For example, you can incorporate losing your man into things like attacking patterns, runs in the box, and even set plays. In Episode 4, we discussed the importance of training and rehearsing throw-in choreography and I posted a video in the write up for that episode on 343coaching.com. I’m going to post the same video at the bottom of this episode. Why? Because in that video there plenty of examples of losing your man, both basic and complex. But more importantly, it highlights how this core activity becomes woven into the way the players DNA and is able to be deployed in a number of situations during actual games. The examples might be hard to spot at first, so don’t get frustrated if you don’t see them right away. This is an example of what we talked about in episode 1 of this coaching series when we discussed having vision. Not having A vision, but having vision. We’ll connect more dots later down the road. For now, I want to encourage you to check out this one video and see just how simple, but powerful losing your man can be when trained consistently and properly. Fantastic description of how this links the build-up to the attack!